Jesus gave James and his brother John the surname/nickname Boanerges, which means “sons of thunder.” No one knows what this name refers to, but could possibly mean they had fierce tempers, or were powerful orators and advocates, or both. 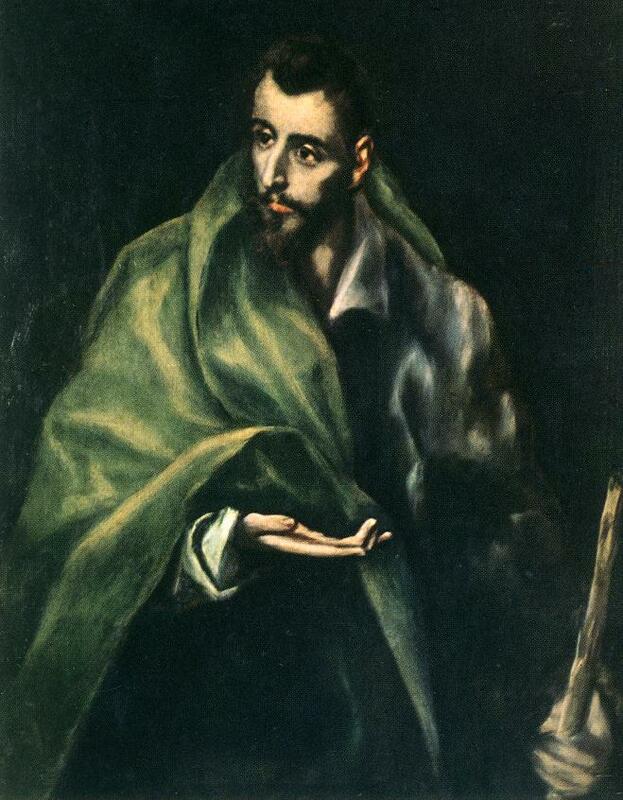 Saint James (Santiago) is the patron saint of Spain and according to legend, his remains are held in Santiago de Compostela in Galicia, the Celtic region of NW Spain. The traditional pilgrimage to the grave of the saint, known as el camino de Santiago (“the way of St James”), has been the most popular pilgrimage for Western European Catholics from the early Middle Ages onwards. 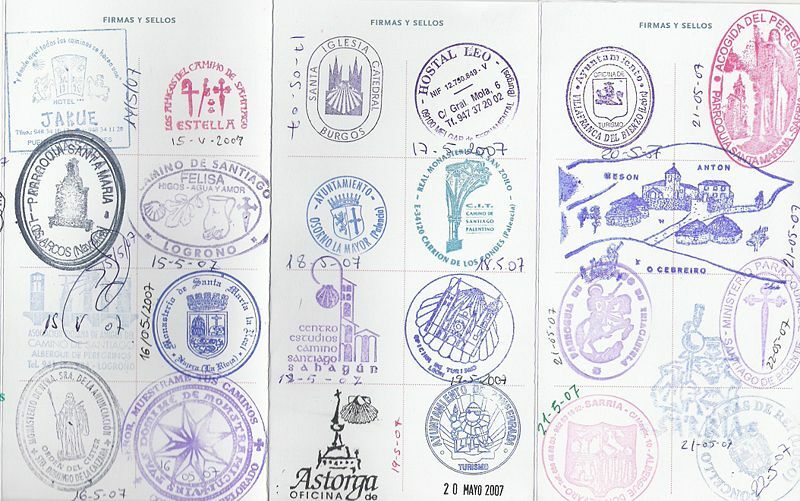 125,141 pilgrims registered in 2008 as having completed the final 100 km walk (200 km by bicycle) to Santiago to qualify for a Compostela (certificate of completion and plenary indulgence). When 25 July falls on a Sunday, it is called a Jubilee year, and a special east door is opened for entrance into the Santiago Cathedral. Jubilee years can fall every 5, 6, or 11 years. In the 2004 Jubilee year, 179,944 pilgrims received a Compostela. 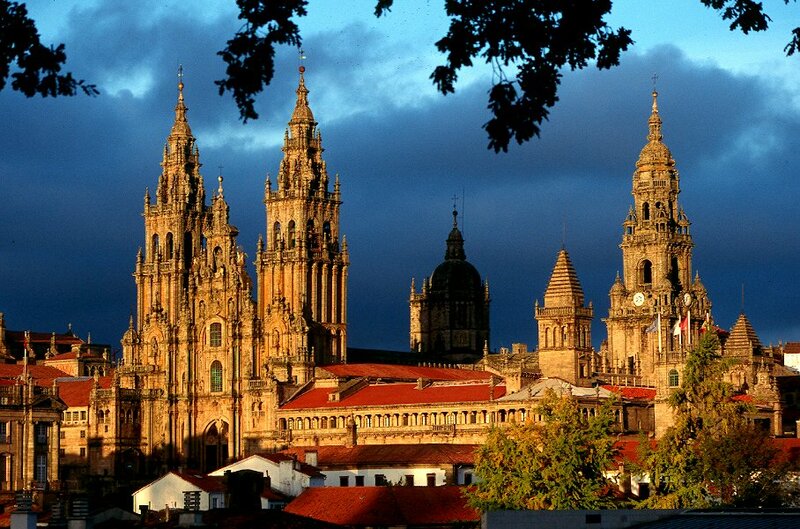 The city of Santiago de Compostela became the seat of the saint, from the legend of his body having been miraculously translated there. His remains were supposedly conveyed from Jerusalem, where he died, to Spain in a ship of marble. On arrival the horse of a Portuguese knight plunged into the sea with its rider and, when rescued, the knight’s clothes were found to be covered with scallop shells. So the scallop shell became the sign of the pilgrim, usually worn on a coat or hat. 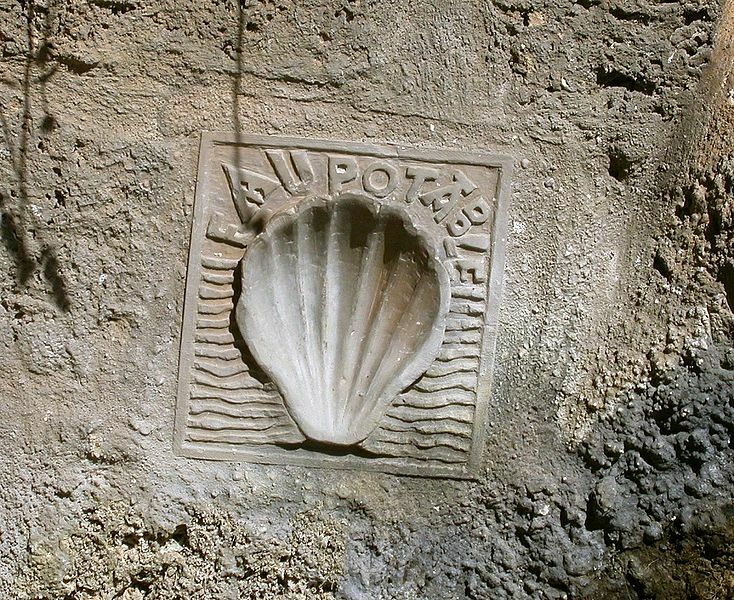 Medieval Galicians who were willing to accept passing pilgrims into their homes hung scallop shells over their doors. In French, une coquille Saint-Jacques – literally, a “St James shell” – is the culinary term for scallop. 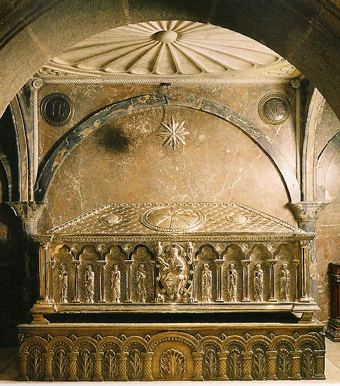 The remains of the Apostle lay forgotten until the year 813, when a hermit named Pelayo was led to their hidden site by a shining star (compostela). The local bishop had the cathedral erected at this location where the bones of the saint supposedly lie in a chapel located in the basement of the church. The pilgrimage to Compostela became almost as popular and important in medieval Europe as that to Jerusalem. Because of this, seventeen English peers and eight baronets have scallop shells in their arms as heraldic charges. I’m really torn concerning the recipe of the day. Coquilles Saint Jacques is the obvious choice, but there is an old English saying that if you eat oysters on St James you will have good fortune for the coming year. I think the simplest compromise is to make Coquilles Saint Jacques for dinner and have a few oysters on the half shell as an appetizer. 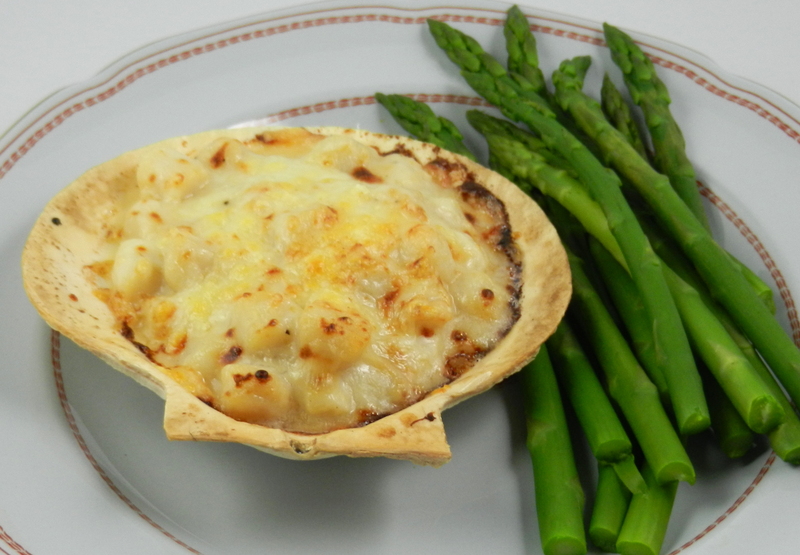 You can get baking scallop shells online or in a good cookware store. In a pinch you can make this dish in ramekins but it really is not the same. Asparagus makes a nice accompaniment. Simmer the bay leaf, tarragon, salt and pepper in the wine for 5 minutes. Add the scallops, mushrooms and enough water to barely cover them. Bring to a simmer, cover and simmer slowly for 5 minutes. Remove scallops and mushrooms with a slotted spoon and set aside. Reduce the cooking liquid to one cup by rapidly boiling. While the liquid is reducing, whisk the egg yolks and cream in a bowl. In a separate saucepan, melt the butter, add the flour, and cook over low heat for two minutes, stirring constantly. Do not allow this roux to brown. Remove from the heat. Add the cooking liquid slowly while whisking. Then add the milk, whisking to blend into a smooth sauce. Return to the heat and simmerl for one minute. Whisk the sauce from the pan into the egg yolk mixture, by driblets. Return to the pan and simmer, stirring, for 1 minute. Thin with cream if necessary. Season to taste with salt, pepper and a few drops of lemon juice. Mix ? of the sauce with the scallops and mushrooms. Butter the shells or ramekins; spoon in the scallop mixture and cover with the rest of the sauce. Sprinkle with cheese and dot with butter. Arrange the shells on a broiling pan. The recipe can be prepared up to this point at any time before the meal. Fifteen minutes before serving, set the scallops 8 to 9 inches beneath a moderately hot broiler to heat through gradually, and to brown the top of the sauce.